Our last morning on the beach for our little Florida mini-vacation was really beautiful. First a sunrise that I was too tired to get dressed to photograph, but I did see it. 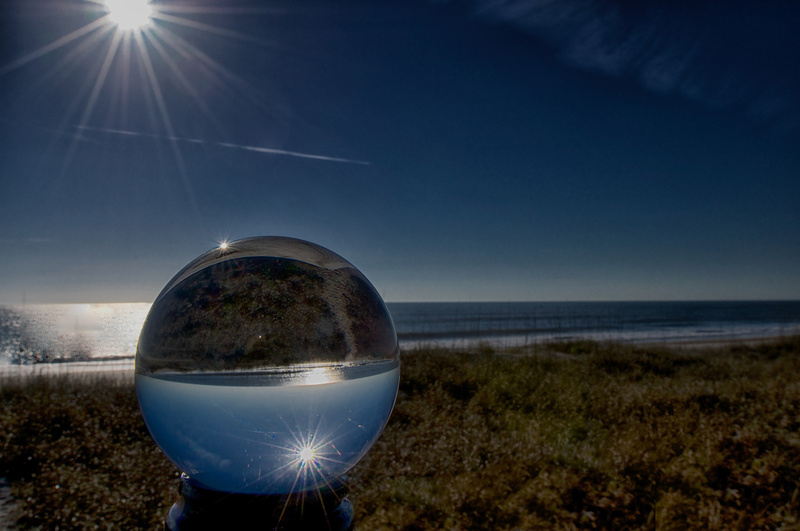 Then, time on the beach with my crystal ball as the sun was rising (more shots later this week, I suspect). The three sunbursts are: the real one, the teeny reflection at the top of the crystal, and the main one in the sky of the crystal. Nooooo!!!! This...is...amazing!!!! Oh I love this so much! I want to go out and buy one tomorrow!! Fav!!! Gorgeous - love a crystal ball shot. @anazad511 :-) Thanks Ana! I threw it in at the last minutes and was so glad I did! There are so many great shots on 365 with the balls on the beach so I really wanted to do one myself. @nanderson @luvmynynix Thanks for the fav's and kind comments Nancy and Laurie! lovely shot with fab sunbursts. Man there are so many things I could use a crystal ball for!!! That aside this is a great shot.. Those sun bursts are awesome!! Love it and fav! I need one of those! I love the double sunbursts. Fabulous Taffy! Love the whole image and especially the double sunburst! I must remember to take my crystal ball on holiday! Fav! Superb, that sunbust is just the icing on the cake!! And me, must take mine to the USA in May.....could be interesting if my luggage is searched! You rocked it! These balls are addicting! Just superb. Mine is on the way from China as we speak but I don't think I will manage a shot of this calibre!! @steampowered Thanks Paul. I've been wanting to do something with this for awhile and was inspired by several I'd seen on the site. @rustymonkey Thanks Karen! I appreciate your visit and comment. @ourrube Thanks for the fav, Ruby! Love the sunbursts in the sky and on the ball! Great idea to take it on vacation! An interesting creative shot. Love the sunbursts. Happy holidays. Wonderful idea....great sunbursts....well composed....Very nice! Wonderful composition and sunburst. Love how you captured the reflection on that globe-like object. Wow! Super sunburst, brilliant composition! Love it! Awesome FAV! Wonderful shot. Looks like a lucky moment but knowing your other work I think it was not just a luck. Your crystal ball shot is wonderful. How big is it? Fav! Exquisite sunbursts! And very creative perspective! Wonderful! I've been thinking about purchasing a crystal ball. What size is yours? Beautiful result with those sunbursts! Wow, love this shot, you nailed it! Fave! Amazing idea with the crystal ball on vacation...........love the sunbursts and the early morning lighting. So creative, and it's a fav! You carry this ball with you on vacation? LOL. Great outcome with this shot. Awesome! Those starbursts are gorgeous. I have to get myself a crystal ball! It must have been fun trying this, and the result is cool. @busylady @shepherdmanswife Thanks for the kind words! I bought mine on Ebay awhile ago and went back on to see if I could find the history. This comes the closest to the one I have: http://www.ebay.com/itm/50mm-Stand-Asian-Rare-Natural-Quartz-Clear-Magic-Crystal-Healing-Ball-Sphere-/161179242181?pt=AU_RocksFossilsMinerals&hash=item2587080ec5 - -it's 50mm. Mine may be a little smaller but it's close. I might have gotten one slightly larger if I had it to do over again, but not by much. taffy you are on a roll at the moment - this is excellent and fav for sure! wow thats an amazing shot. love the clarity on those 3 star bursts - Fav! Fantastic - need to get a crystal ball. Great idea, love the colors. Super shot! Love how the starburst bursts out of the crystal too! Really love this - like the crystal ball so large in the foreground - beautiful photo. Awesome and awesome!! Two sunflares for the win! Great shot! Ok, I'm sorry, but I have to say this ... NEATO! This is beautiful! I also took my crystal ball away on the weekend and had a similar shot in mind. This is much better than mine, fav! Wow! Beautiful!! What a great shot. Fav! Lovely clarity -- just stunning! Too FaVulous for words! Super FAV! Glad you had such a good time and hope things will warm up at home for you soon! My oh my oh my! Fav! Those sunbursts are just phenomenal - you are so clever! Love the shot. Wow - awesome and amazing - love those sunbursts!! Instant Fav! Congrats on PP also. great shot of the lensball at the beach, i've done quite a few too and take it most places i go, it now lives in my camera backpack!